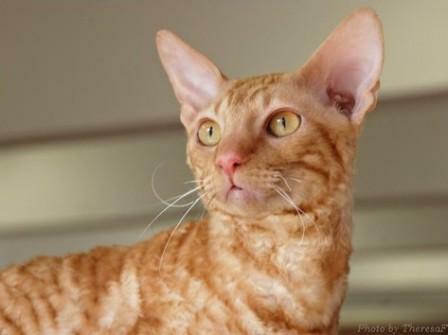 The Cornish Rex cat is a domestic cat breed with a wavy-coat that originated in Cornwall England in 1950. When the cats were exported to the United States in 1957 the breed was under threat and the gene pool was limited. 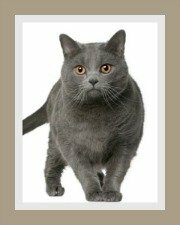 Once the cats arrived in the USA, American breeders were forced to outcross their Cornish cat to other cat breeds and this resulted in slight differences in the breed look, the most notable been the shape of the head and torso. The breed is popular in the US but still remains a rare cat breed. 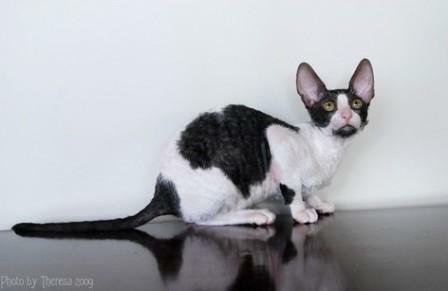 The Cornish Rex cat has uniform waves all over the body including the tail. The coat is wavy, short and dense, with no guard hairs. The waves are named Marcel waves after a hairstyle of the 1920's. The coat comes in a range of colors and patterns e.g. solid white, black, and red to tabbies, tortoiseshell, bi-color and pointed colors. The pointed variety is called a SI Rex. The British Cornish Rex cat's torso is small to medium in size, but long. Its back is very arched and the chest is full and deep. The bone structure is described as fine and the muscles, firm and powerful. The American type also has a small to medium size body which is long and slender with a small waistline. 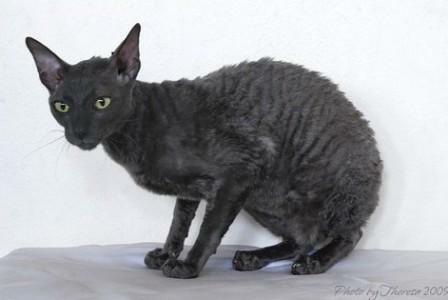 The British Cornish Rex cat has a moderate wedge-shaped head (i.e. the length is greater than the width). Nose is straight - straight line from middle of the forehead to the nose tip. The American Cornish Rex has an egg-shaped head, Roman nose and prominent cheek bones. The British and American type Cornish Rex have oval-shaped, medium to large eyes that slant slightly upwards. The color of the eyes should be appropriate to the coat color and also be shiny, clear and the color intense. Ears are large, wide at the base with rounded tips and covered with hair. The ears are erect and alert. The term hypoallergenic is defined as been slightly or low in allergies, but certainly not 'non' allergic. Many people believe that rexed and 'hairless' cats are hypoallergenic, but this is not entirely true. Cats that are described as hypoallergenic do produce allergens. Fel D1 is a protein responsible for causing the allergies. This protein is found on the skin, hair and saliva of cats. When a cat grooms itself, the old, dead skin cells referred to as dander, which contains Fel D1, is left on clothing, furniture and bedding and this causes the allergic response. Knowing this, the type of coat would therefore have no affect on allergic reactions. 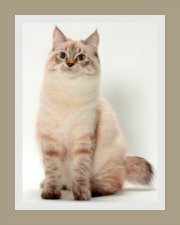 We have read that tests were conducted and it was established that around 10 % of allergy sufferers can tolerate this wavy haired cat breed. Our suggestion would be that before adopting any cat, that allergy sufferers visit the cattery, handle the cats and spend some time with their potential pet. Animal shelters are littered with unwanted cats, so prevention is better than cure. These are high energy pets that need lots of attention and will suit a home with children. 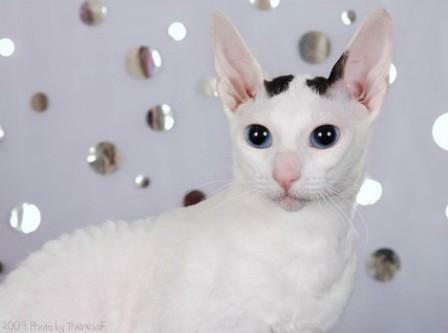 The Cornish Rex cat is best suited to indoor living. It's important to create an adventure zone for your indoor cat to alleviate boredom. Many cat breeders have contracts that stipulate that the cat must be kept indoors only. If your cat is allowed outdoors, it must be an escape-proof garden. Having these cats in your life means you'll be entertained for hours. They are lively acrobats and retain their clownish, kitten-like personalities into adulthood. They are playful and energetic and love fun games like fetch. These cats are highly sociable cats and detest been left alone. Solitude is just not for them! They adore their humans and are very affectionate, gentle and loving. They are always in motion, but when they do settle for a moment, they are wonderful lap cats. In fact they love warm places to curl up in. This breed can be quite demanding and their voices can be loud and harsh when they need attention, but they are generally quiet. All cats produce oils that nourish the skin and hair. 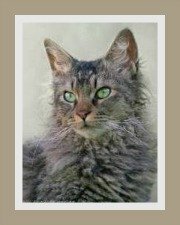 The Cornish has short, wavy hair that generally does not absorb these oils as much as cats that have a longer and denser coat. These oils tend to accumulate, making the fur oily and this in turn attracts dirt and grit. This means that your cat will require frequent bathing. It is also important not to over-groom your cat - a weekly very gentle brush (in the direction of the hair growth) is all that is required. 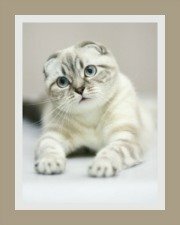 For more information on cat care take a look at our comprehensive pages. Generally the Cornish Rex is considered a healthy breed. They are prone to gingivitis (gum disease), which is quite common in many cat breeds, so dental hygiene is important. Hypertrophic cardiomyopathy (heart defect) has been noted in some Cornish Rexes. 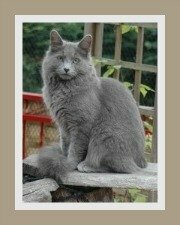 This is a common heart disease amongst certain cat breeds and can be screened for. Blood type incompatibility amongst breeding cats which results in the death of kittens. Reputable cat breeders do screen for this. An annual visit to the vet for vaccinations, regular de-worming and dental hygiene and a good quality diet is all that's needed. The Cornish Rex has a very good appetite, so you will need to watch your cat's weight. You need to purchase the best cat food you can afford. As a pet owner you have the choice of feeding your cat a raw diet, canned cat food or dry kibbles or a combination of the three. Avoid cow's milk in you kitties diet - cat's drink water! 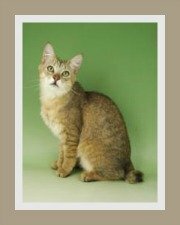 Cornish Rex cat breed weight? These cats have an average life span of 12 + years. A number of factors will the determine your cats life expectancy. Find out more about this in our chapter on how long do cats live.